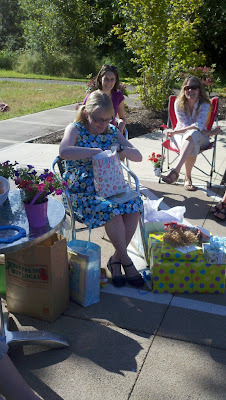 I am lucky to have such wonderful friends who threw me an amazing baby shower last weekend. They were very creative in the planning -- hosting the event at Pringle Creek Community, a green and sustainable community here in Salem. They also had a frozen yogurt bar featuring yummy fro-yo from Fairview Farm Dairy, a great local organic goat farm that Stuart and I have happily visited the past few years (baby goats are the cutest thing ever!). 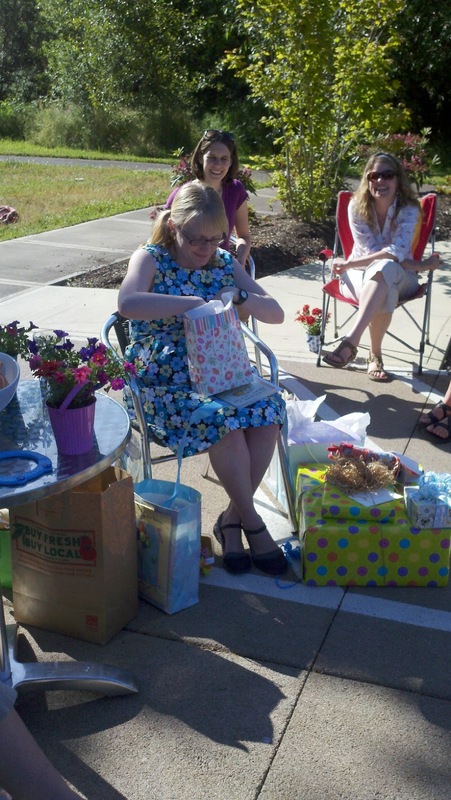 Most importantly, I was surrounded by wonderful friends who were so supportive and showered us with all sorts of amazing gifts for the baby. They increased our little one's library of books, added to our growing cloth diaper collection, and gave us a whole array of other great things. We are so thankful for everyone's kindness. I'm especially thankful to Stephanie and Beth, the wonderful co-hosts who made it all happen. Me with Kobbi. My dress was made by my mother-in-law. Me with my other pregnant friend Melissa, who just had her baby a few days ago! Hula-hooping was a popular activity. Everyone decorated onesies for the baby. Very cute! Thanks for all the great gifts!